As the Founding Fathers drew up the blueprint for the great experiment of American democracy, they knew that there would be times when simple majority rule might not be fair. So they created the judicial branch as a counterbalance to the legislative branch, with the idea that a Congress could be prevented from enacting laws that violate the Constitution - in particular laws which infringe upon the rights of individuals. We're a capitalist society, so individuals should be free to choose where their kids go to school and how much they're willing to spend for their kids to get the quality of education they desire. Poor folks should work harder and make better choices. It's not clear that we even need government involved in education - can't private enterprise solve this problem? Our public education system should be the 'great equalizer' in our society, giving all kids an equal opportunity to succeed in our economy, regardless of the financial resources of their families. People should be taxed progressively (the higher the income, the higher the tax rate), but the money should spent equally - the same amount per student in every school. Perhaps the best way to accomplish this is with a federal school system. Let's have some kind of middle ground: Determine the amount of money required for every kid to get a "thorough and efficient" education, and use the tax system to redistribute wealth as necessary so that every school district has at least this amount of money to work with. It's okay for more affluent districts to tax themselves more and spend more, as long as the poorest districts get enough. The first two are the extremes of course. The first would be characterized by most as being the far-right conservative position, while the second is the far-left liberal perspective. Their perspectives on what is "fair" are pretty clear, but not at all compatible. The third viewpoint is the center of the bell curve - an opinion with which most Americans would agree. It's also the language of Ohio's Constitution, and of the Ohio Supreme Court decisions in the DeRolph case. However, there is still a great range of opinion allowable in that definition, and the debate is far from over. The July 13, 2013 edition of the Columbus Dispatch ran a story about school funding fairness in Ohio. Accompanying the story was this chart:. Note the statement under the title: "...certain types of districts benefit more than others." This is a comment about fairness. We can also observe that the way the numbers are presented in this chart are influenced by the writer's political leaning. I think you might agree that from this perspective, the small number of "wealthy" districts didn't get much in the way of new money at all. The percentage increase for the wealthy districts is larger because the denominator of the fraction is smaller to start with. In dollars, the wealthy districts will receive $230 additional per student, while the urban districts will get $630 more. Note that each of these school districts is a "net receiver" of funding - they receive more school funding than they pay out in state income taxes. The sole exception is the so-called Wealthy Suburb - which Hilliard is considered to be by the State of Ohio. I've used New Albany as the example for the chart. They receive 4¢ of state funding for every dollar of income tax paid. In the case of our school district - Hilliard City Schools - this fraction is 39%. In other words, for every dollar in State Income Taxes we collectively pay, the State of Ohio sends back 39¢ to help fund our school district. 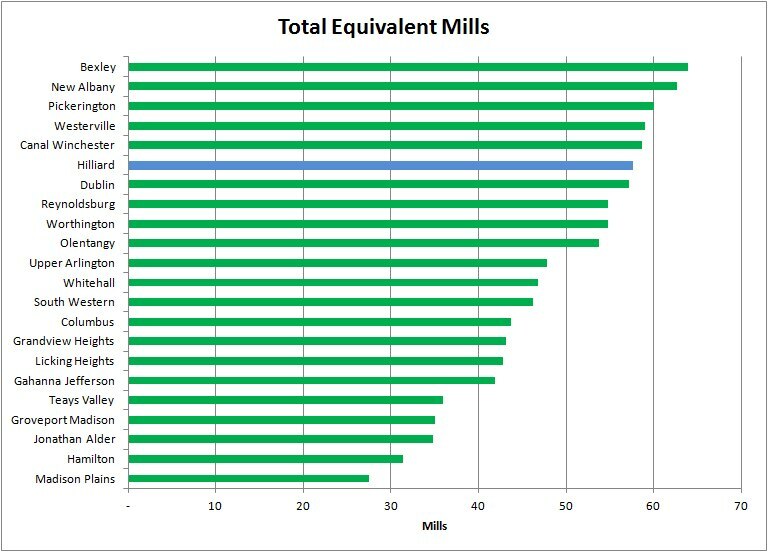 Whether or not you think it is, the relative allocations depicted in the chart above are unlikely to change. Districts like ours will continue to be viewed as the "cash cows" by all the others, who also hold the majority of the seats in the General Assembly. The consequence, as I have long expressed here, is that the Hilliard Schools community is largely on our own from a funding standpoint. Regardless of this small adjustment in our funding in the new state budget, it will remain true that as our spending rises, nearly all the new money will need to come from local sources - primarily residential homeowners. 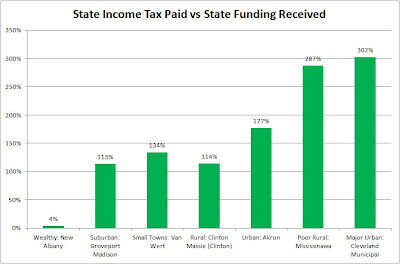 And as our incomes rise, most of the additional tax money collected by the State of Ohio will go elsewhere. ... which is another important conversation about fairness. The July 12, 2013 edition of the Columbus Dispatch ran a story about the 9.01 mill operating levy being recommended for Columbus City Schools. 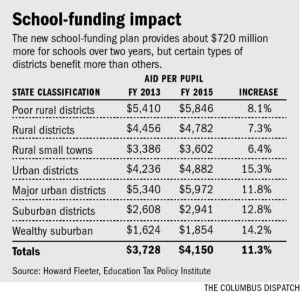 Included with the story was a chart comparing tax rates for most of the school districts in Central Ohio. 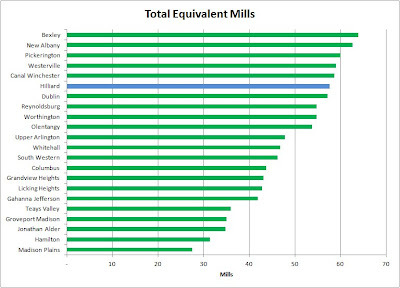 The list is sorted by "Total Mills," in descending order. We all love to see where we stack up on things, so I'm sure most of you have taken note that Hilliard City Schools is third from the top of this list - which is ordered in terms of "Tax Cost per $100,000 of Property Value" - right behind New Albany and Westerville. Does that mean we're the third most expensive district in the area, in terms of taxes collected? Not quite. 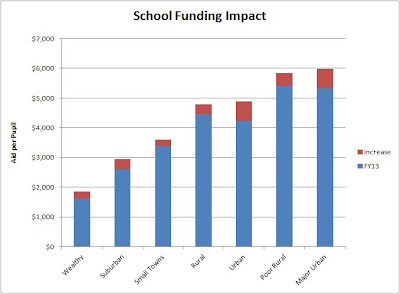 You'll notice that this chart indicates that there are several districts which also levy a school income tax. 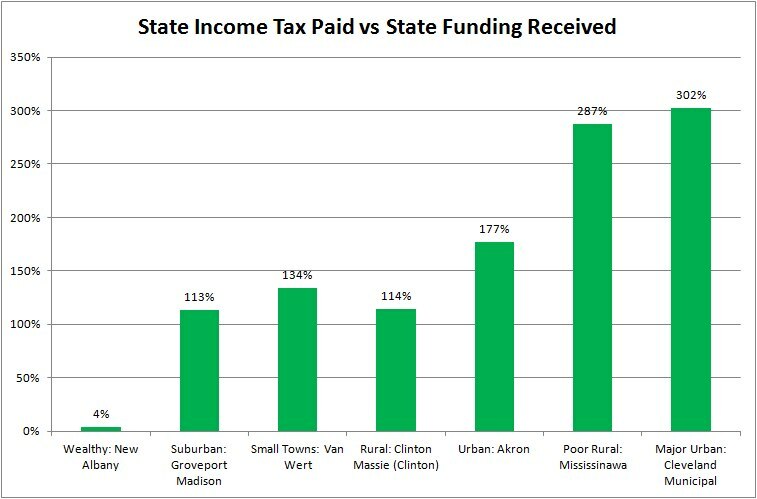 Some districts charge the income tax against all income: Pickerington (1.00%), Canal Winchester (0.75%), Reynoldsburg (0.50%), and Bexley (0.75%); while others levy their income tax only against "earned income": Teays Valley (1.50%) and Jonathan Alder (0.75%). When income taxes are included in this manner, Bexley rises to #1 on the list, and we fall to #6. My method has one flaw - there is not a perfect correlation between property value and income. One generally relates to the other, but there are exceptions. For example, we've heard the story about how Warren Buffett still lives in a modest house he purchased decades ago, even though he has become one of the richest people in the world. For such a person, it's better to be taxed on property value than income. Just the opposite might be true for someone who is retired and whose income has diminished substantially, yet still resides in a home which was bought and paid for during their working years. For such folks (like me! ), the "earned income only" form of school tax is preferred over additional property taxes. As I wrote a couple of weeks ago, the extra chunk of money our district received in the new state budget gives us some time to make some important decisions about the future of our school district, which is the same as saying the future of our community. One of those decisions is how we might want to raise any additional local funding needed in the future, and income taxes need to be part of the discussion. I hope you will engage in the dialog. Time to Think About Open Enrollment? The Middletown Journal published a story recently about how public school districts in Ohio are increasingly using open enrollment to fill empty seats and increase their revenue. "Open enrollment" is a term used to indicate that a school district will accept students from outside its geographic boundaries. This is currently not the policy of Hilliard City Schools - a student must be a legal resident of our school district to attend our schools (see Policy JEC). I wrote about this a year ago, when Reynoldsburg City Schools decided to allow open enrollment. My observation then was that to a public school district, the change to open enrollment by another nearby public school district is the same as if a new charter school had opened. By that I mean that when a student transfers out of the student's home district to attend either a charter school or another public school district, the chunk of money the home school district receives from the State of Ohio that's associated with the student goes with him. So for those districts who lost kids to Reynoldsburg, it had the same fiscal impact as if they had gone to a charter school. I'm not sure exactly what that amount of money is under the new school funding mechanism, but let's say it's on the order of $5,000 per student. My understanding is that this has been generally a positive experience for Reynoldsburg schools. They were able to fill some empty seats, which means more revenue and virtually no cost. Conversely, the home districts for those students now have more empty seats, and it's unlikely their costs diminished to any significant degree. The students who transferred to Reynoldsburg were generally highly motivated kids who performed well and behaved well - another kind of loss to the home district. According to this story from Middletown, ten of the eleven school districts in Butler County have gone to open enrollment, including Lakota Local Schools, a district of 18,000 students with demographics very much like ours. So what has this meant to Lakota? First thing to clarify: a district needs to offer open enrollment in order to gain students from other districts. A district can lose students to other districts regardless of its own enrollment policies. In other words, Hilliard City Schools can lose students to another school district with open enrollment, even though we do not ourselves have open enrollment. This story reports that Lakota has had a drop in enrollment of about 1,500 students since the the 2009/10 school year. Those aren't necessarily students lost to other districts, but rather more likely represents a drop of the total number of students within their borders. Open enrollment is a good way to offset that kind of organic loss, and for the coming year, Lakota has 123 requests for enrollment by students outside their district. If my $5,000/student number is in the ballpark, this will generate about $600,000 more in state funding - new dollars raised without any new taxes on their community. But something more subtle is going on in Butler County. The school district borders drawn long ago now have diminished meaning, since every family in their county has the choice of any school district to which to send their kids. In other words, the school districts have to compete for students, and not with tiny charter schools, but with other school districts with varying ranges of offerings. It's still not quite a free market. While a public school district no longer has the exclusive right to serve all kids in within its borders, it does retain the exclusive right to collect property taxes within its borders. They also retain the exclusive right to construct school buildings within their own borders (exempting charter schools). So if a kid lives on one district, and wants to attend a school operated by another, that kid needs to figure out the transportation problem. It's not like competing districts can build on the same block. That can be an impediment for elementary and middle school kids, but lots of high school kids can drive. I wonder what would happen in our region if more of the school districts chose to use open enrollment as a way to raise revenue. At first, it would make sense only to districts which have available capacity. That rules out Olentangy, which has been growing almost too fast to keep up. But I wonder what districts like Worthington and Upper Arlington might do. In the case of Worthington, enrollment has been declining in recent years. That community went through its big growth spurt starting in the 80s through the 90s, and now most of those kids have graduated. Without a lot of developable land left to house new families, they may be entering a time when their enrollment permanently settles at a lower level. As a highly respected district that shares a lot of its border with Columbus City Schools, Worthington might see something like Reynoldsburg - an influx of motivated kids who will help keep their performance high, while also bringing along a nice chunk of state money. UA is in a different situation. The growth spurt for UA was decades ago, and they've already gone through their downsizing (e.g. Wellington School is built on the grounds of the former Fishinger Elementary). They have no more developable land, unless OSU sells off big tracts of their holdings, but are seeing a fairly steady turnover as the elderly are selling their homes to young families, which is keeping enrollment from collapsing. They're also are having some challenges getting a levy passed. Their last one was defeated, and there appears to be ongoing resistance to the next one. They could use some money. Would UA consider open enrollment as part of the solution? Their northern and eastern borders are shared with Columbus Schools, and I suspect there are lot of families in there who would love to have their kids attend UA schools while paying Columbus school taxes. Would the people of UA be willing to let those kids fill some empty seats and in order to garner a little more revenue? I'm guessing not. What about our community? We do have some capacity in some of our schools. And we have a couple of weird pockets of homes within our borders which are actually part of Columbus schools (because of the Win-Win Agreement), occasionally to the surprise of the buyers. For example, there a few dozen homes around Darby Creek Elementary which are served by Columbus Schools. Should we accept a limited number of kids via open enrollment, knowing that in these cases, it really would be the "Hilliard Schools, Columbus School Taxes" scenario many mistakenly believe already exists? It's not an irreversible decision. We can offer open enrollment for a year or two, then shut it down again. A hundred kids would be a half-million in new revenue, and little incremental cost. I wonder what would happen if every school district in our region went to open enrollment, as they have done in Butler County. Who would be the winners, and who would be the losers? After discussions with the City of Hilliard, the management of Rockford Homes has decided that this land development opportunity no longer makes economic sense, and has therefore chosen to terminate the deal, as is its prerogative. To my knowledge, there is no one else interested in purchasing the property at this time. Here are the documents provided to the School Board in connection with our upcoming meeting, to be held at 7pm on TUESDAY July 9, 2013 at the Central Office Annex, next to the Innovative Learning Center (the former Central Office building). This will be the first meeting with Dr. Marschhausen in office as our Superintendent. If you haven't already noticed, Hilliard City Schools now has an official blog, called Get Connected. The first entry is by Dr. Marschhausen, and I expect he will write many more entries going forward. Item F1 on the agenda is a resolution to request annexation of a small parcel of land the district owns on Cosgray Rd into the City of Hilliard. This is part of the larger 124 acre tract of land which we recently agreed to sell to Rockford Home. The other 122 acres were annexed into the City of Hilliard long ago, soon after the land was first purchased. Taking care of this annexation now will satisfy one of the several contingencies in the purchase agreement. It may also be helpful (or necessary) to facilitate the annexation of Homestead Park into the City of Hilliard, which is being done to allow water/sewer services to be extended into the park. Item F3 is the third and final reading of a batch of changes to Board Policies. Item C3 is the routine resolution approving the Treasurer's Monthly Financial Report.